The movie versions and genuine articles shot in a Fort Worth photography studio. Butch is on the right in black-and-white photo. Care to have your Wild West heroes and villains de-mythologized? 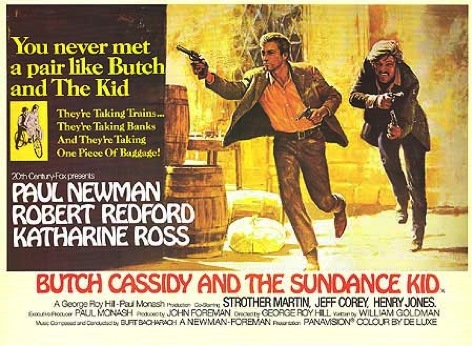 PBS’ long-running American Experience series does it again with Butch Cassidy & the Sundance Kid (Tuesday, Feb. 11th at 8 p.m. central) after previous dissections of Wyatt Earp, Jesse James, George Armstrong Custer, Annie Oakley, Kit Carson, Buffalo Bill and Billy the Kid (which encores before Butch and Sundance). The famed 1969 film starred Paul Newman and Robert Redford at the heights of their glamorous powers, with Katharine Ross assisting as Sundance’s girlfriend, Etta Place. Butch and Sundance went out in a blaze of glory, freeze-framed and out-gunned in the act of their last stand against a big batch of Bolivian soldiers. Their real-life demises were decidedly less legendary but won’t be revealed here. Besides, the movie wouldn’t have worked with that kind of an ending -- and perhaps still wouldn’t. The PBS documentary is written, produced and directed by John Maggio, who performed the same duties on Billy the Kid. It’s a solidly workmanlike effort, with a small posse of writers and historians called upon to dramatize matters with their usual certitudes. Such as, “This is a dangerous game they’re playing.” One of the experts, Thom Hatch, bears a more than passing resemblance to the late character actor Strother Martin, who played a supporting role in the Butch and Sundance feature film. Butch was born Robert Leroy Parker to a large Mormon family while Sundance arrived as Harry Longabaugh, the future pride of Phoenixville, Pennsylvania. 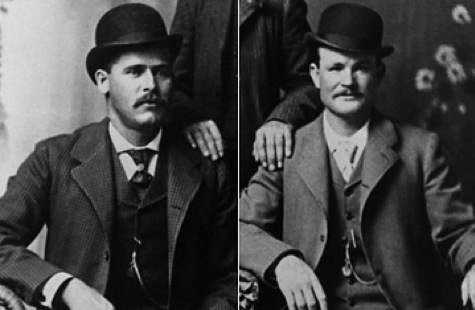 You’ll learn how they got their bank- and train-robber names, why they became a dying breed and how they just happened to have their last formal photos taken during an undercover stop-off in Fort Worth. Neither man could match Newman or Redford in looks. But a picture of the real-life Etta Place, of whom little is otherwise known, shows her to be quite a turn-of-the-century cutie. This isn’t one of American Experience’s more epic efforts. Still, it’ll do while the series figures out what to do with the likes of Wild Bill Hickok, Calamity Jane and Bat Masterson. Surely their times are coming.